Sandwiched between The Confessions of Saint Augustine (AD 398 and A Long Way Gone: Memoirs of a Boy Soldier by Ishmael Beah (AD 2007) are thousands of memoirs. Both intimate and intriguing, these personal stories represent a form of expression that has become enormously popular in the last twenty years, dominating bestsellers lists nationwide. Rising concurrently are books and articles that seek to analyze the memoir and explain its enduring popularity and prodigious growth. Contributing writer for the San Diego Reader, memoirist, and writing coach Thomas Larson thoroughly explores the genre from a place of love and critical thinking. He dives headfirst into a sea of human stories, explaining and comparing, bringing readers a better understanding of the uniqueness of the niche. As a form, memoir has developed and distinguished itself from autobiography and biography. Rather than a sweeping look at the author’s life from birth until the present, often a tale told by a so-called “great man” at the end of his life, memoir has scratched its way to the surface by revealing the lives of common people in uncommon circumstances. Larson explains that both known and unknown figures have embraced the personal narrative as a tool for self-expression and self-aggrandizement, healing and analysis, immediacy and personal mythology. 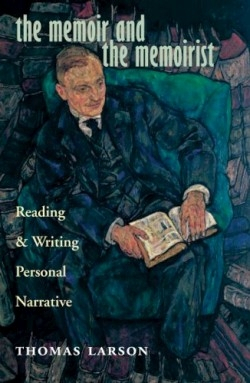 Written with clarity, Larson’s contribution to the analysis of both what drives writers to deliver to a hungry audience the intimate details of their lives, and his opinions about the reason why we keep reading, makes for an enlightening book.